This volume presents the most current perspectives on the role of metacognition in diverse educationally relevant domains. The purpose is to examine the ways in which theoretical investigations of metacognition have recently produced a strong focus on educational practice. The book is organized around four general themes relevant to education: metacognition and problem solving, metacognition and verbal comprehension, metacognition and the education of nontraditional populations, and metacognition and studentship. Chapter authors review current literature as it applies to their chapter topic; discuss theoretical implications and suggestions for future research; and provide educational applications. Each chapter describes testable theory and provides examples of how theory can be applied to the classroom. The volume will have wide appeal to researchers and students concerned with the scientific investigation of metacognition, and to practitioners concerned with the cultivation of learning and achievement in their students. 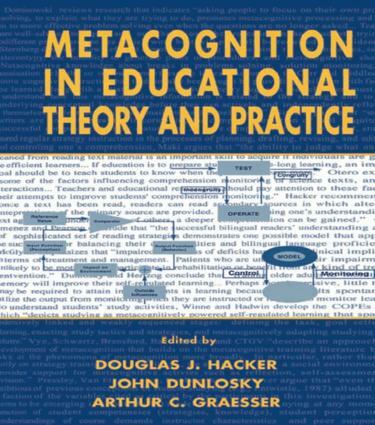 The unique contribution of this book to the literature on metacognition is its presentation of the most current research examining specific theoretical aspects of metacognition in domains directly relevant to education. This is especially valuable for the many researchers and practitioners who subscribe to the concept that by fostering metacognitive processes during instruction, more durable and transferable learning can be achieved. Contents: T.O. Nelson, Metacognitive Food for Thought in Educational Theory and Practice. Preface. D.J. Hacker, Definitions and Empirical Foundations. R.L. Dominowski, Verbalization and Problem Solving. J.E. Davidson, R.J. Sternberg, Smart Problem Solving: How Metacognition Helps. M. Carr, B. Biddlecomb, Metacognition in Mathematics From a Constructivist Perspective. B.M. Sitko, Knowing How to Write: Metacognition and Writing Instruction. R.H. Maki, Test Predictions Over Text Material. J. Otero, Influence of Knowledge Activation and Context on Comprehension Monitoring of Science Texts. D.J. Hacker, Self-Regulated Comprehension During Normal Reading. G.E. García, R.T. Jiménez, P.D. Pearson, Metacognition, Childhood Bilingualism, and Reading. S.M. McGlynn, Impaired Awareness of Deficits in a Psychiatric Context: Implications of Rehabilitation. J. Dunlosky, C. Hertzog, Training Programs to Improve Learning in Later Adulthood: Helping Older Adults Educate Themselves. P.H. Winne, A.F. Hadwin, Studying as Self-Regulated Learning. N.J. Vye, D.L. Schwartz, J.D. Bransford, B.J. Barron, L. Zech, The Cognition and Technology Group at Vanderbilt, SMART Environments That Support Monitoring, Reflection, and Revision. M. Pressley, S. Van Etten, L. Yokoi, G. Freebern, P. Van Meter, The Metacognition of College Studentship: A Grounded Theory Approach. J. Dunlosky, Epilogue. Linking Metacognitive Theory to Education. to disseminate ideas from around the world, including Europe, Asia, and Africa, as well as the Americas. This series will publish monographs and edited books that advance these goals through new and innovative contributions to educational psychology. Edited books must have a sense of coherence, contain unifying introductory and concluding chapters, and be internally consistent in scope and level of writing. Potential authors and volume editors are encouraged to take risks and to explore with the series editors nontraditional points of vie wand methodologies. Interdisciplinary contributions involving theory and methodology from diverse fields, such as computer science, philosophy, linguistics, anthropology, and neuroscience, are especially welcome, but all contributions must be readable and interesting to psychologists and educators of varying backgrounds. Authors and editors from all around the world are encouraged to submit proposals. Examples of topics that would be of interest include, but are not limited to, creative techniques for instruction, nontraditional forms of assessment, student learning, student motivation, organizational structure and climate, teacher education, new conceptions of abilities and achievement, analyses of cognitive structures and representations in various disciplines, expertise in teaching and administration, use of technology in the schools, at-risk children, adult education, and styles of learning and thinking.